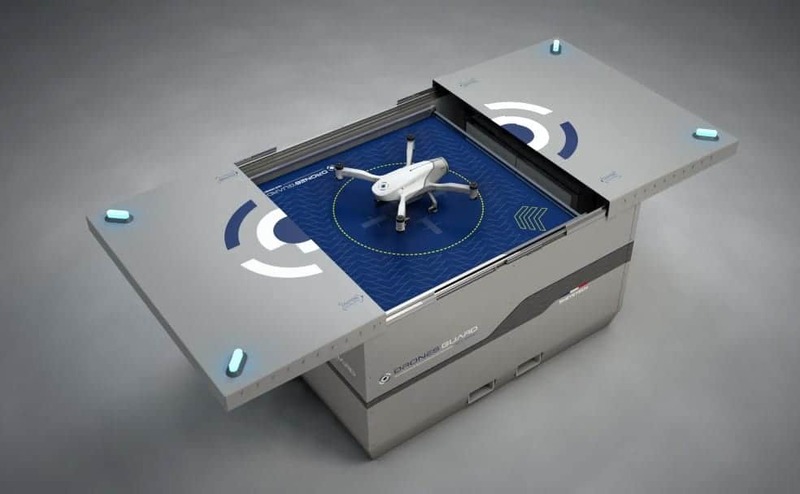 Azur Drones, a developer of unmanned aerial vehicles (UAVs) for surveillance applications, has announced that it has received the first and to date the only approval from the French Directorate-General for Civil Aviation (DGAC) for its fully-automated Skeyetech drone system – which takes off from a docking station and requires no remote pilot. This specific approval is unprecedented, since any authorized flight scenario in France requires a qualified pilot, and is also the first such approval granted in Europe. Skeyetech drones can fly Beyond Visual Line Of Sight (BVLOS), day or night, in urban areas, under simple supervision of a remote operator. With this unique approval, the system will be directly operated by a security guard with no pilot license. The drone will thus be used to patrol an area or provide valuable aerial insights in case of an alarm. “We are very proud of this approval which rewards an 18-month close collaboration with DGAC services. Our system had to comply with the civilian aviation authorities’ requirements in terms of safety, reliability and quality. A process that was obviously very demanding due to the fully automated character of our system,” explained Stéphane Morelli, Azur Drones Managing Director. The company aims to make autonomous drones a standard in the security market, in France and overseas. Azur Drones is already under discussions with other authorities in order to get similar approvals in several other countries.